REPORT ztest_mine_bom NO STANDARD PAGE HEADING LINE-SIZE 125. DATA: eight_directions TYPE TABLE OF i INITIAL SIZE 8 WITH HEADER LINE . 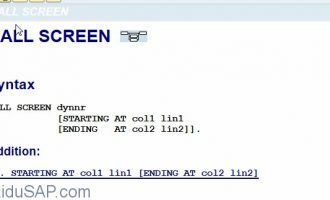 DATA: cells2update TYPE TABLE OF celltype INITIAL SIZE 1000 WITH HEADER LINE. y_ofs TYPE i VALUE 5.
database_id_prefix(21) TYPE c VALUE 'ABAPMINESWEEPERSCORES'. SELECTION-SCREEN BEGIN OF BLOCK bl_game_difficulty. PARAMETERS g2 RADIOBUTTON GROUP one. PARAMETERS g3 RADIOBUTTON GROUP one. PARAMETERS g4 RADIOBUTTON GROUP one. SELECTION-SCREEN: END OF BLOCK bl_game_difficulty. SELECTION-SCREEN BEGIN OF BLOCK bl_high_scores. SELECTION-SCREEN: END OF BLOCK bl_high_scores. PARAMETERS: x_size TYPE i DEFAULT '09'. PARAMETERS: y_size TYPE i DEFAULT '09'. PARAMETERS: bomb_cnt TYPE i DEFAULT '10'. get time stamp field game_time1. METHODS: constructor IMPORTING parent TYPE REF TO cl_gui_container. DATA: js TYPE STANDARD TABLE OF char255 INITIAL SIZE 1000.
hstitle1 = ' :: GAME DIFFICULTY ::'. hstitle2 = ' :: HIGH SCORES ::'. wnd_style = cl_gui_control=>ws_thickframe + cl_gui_control=>ws_child. PERFORM game_create USING 'B' x_size y_size bomb_cnt. IF rest <= 0 AND game = game_in. GET TIME STAMP FIELD game_time2. game_time = game_time2 - game_time1. IF lines( cells2update ) > 0. AT SELECTION-SCREEN ON RADIOBUTTON GROUP one. 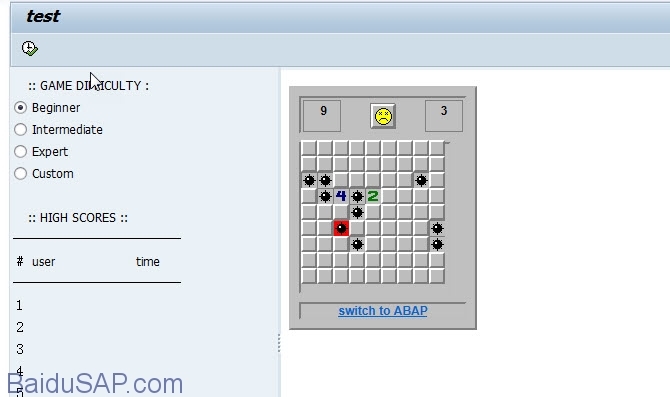 PERFORM game_create USING 'B' 09 09 10. PERFORM game_create USING 'I' 16 16 40. PERFORM game_create USING 'E' 30 16 99. PERFORM game_create USING 'C' x_size y_size bomb_cnt. DATA: ofs TYPE i, ch TYPE c.
WRITE: / 'Bombs left: ', b_left NO-ZERO. WRITE AT x_ofs '|' NO-GAP. WHEN '1' OR '2' OR '3' OR '4' OR '5' OR '6' OR '7' OR '8'. WRITE: ' ' NO-GAP, ch NO-GAP. WRITE icon_breakpoint AS ICON NO-GAP. OR 'a' OR 'b' OR 'c' OR 'd' OR 'e' OR 'f' OR 'g' OR 'h'. WRITE icon_breakpoint_disable AS ICON NO-GAP. WRITE icon_system_cancel AS ICON NO-GAP. WRITE icon_dummy AS ICON NO-GAP. WRITE: icon_wd_transparent_container AS ICON NO-GAP. WRITE: AT x_ofs '' NO-GAP, ' switch back ' COLOR 2 HOTSPOT ON. WRITE: /, /4 'Game over', /, /. WRITE: /, /4 'You win', /, /. WRITE: / ' open: double-click'. WRITE: / ' mark: click and press F9'. FORM cell_mark USING VALUE(ofs) TYPE i. WHEN blank_hidden. setcell blank_marked. ADD -1 TO b_left. WHEN blank_marked. setcell blank_hidden. ADD +1 TO b_left. WHEN bomb_hidden. setcell bomb_marked. ADD -1 TO b_left. WHEN bomb_marked. setcell bomb_hidden. ADD +1 TO b_left. WHEN 'A' OR 'B' OR 'C' OR 'D' OR 'E' OR 'F' OR 'G' OR 'H'. TRANSLATE ch TO LOWER CASE. setcell ch. ADD -1 TO b_left. TRANSLATE ch TO UPPER CASE. setcell ch. ADD +1 TO b_left. 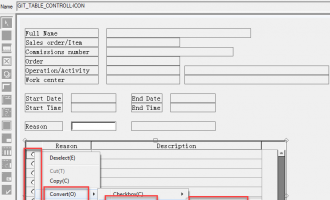 FORM cell_open USING VALUE(ofs) TYPE i. WHEN 'A'. setcell '1'. ADD -1 TO rest. WHEN 'B'. setcell '2'. ADD -1 TO rest. WHEN 'C'. setcell '3'. ADD -1 TO rest. WHEN 'D'. setcell '4'. ADD -1 TO rest. WHEN 'E'. setcell '5'. ADD -1 TO rest. WHEN 'F'. setcell '6'. ADD -1 TO rest. WHEN 'G'. setcell '7'. ADD -1 TO rest. WHEN 'H'. setcell '8'. ADD -1 TO rest. 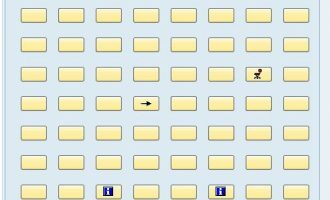 FORM cell_get_clicked CHANGING ofs TYPE i. DATA: row TYPE i, col TYPE i.
row = sy-curow - y_ofs. col = ( sy-cucol - x_ofs - 2 ) DIV 2.
ofs = ( 1 + row ) * rdx + col + 1.
col < 0 OR col > x_size. DATA: floodfill TYPE TABLE OF i INITIAL SIZE 1000. FORM cell_floodfill USING VALUE(x) TYPE i.
setcell blank_opened. ADD -1 TO rest. LOOP AT floodfill INTO x.
ofs = x + eight_directions. FORM cell_open_around USING VALUE(x) TYPE i.
value = value - 1. MESSAGE s000(su) WITH 'Game over'. MESSAGE s000(su) WITH 'You win!' . CONCATENATE database_id_prefix game_size INTO database_id. square = x_size * y_size. square2 = rdx * rdy. MESSAGE e000(su) WITH 'board too large (9999)'. range = max - min + 1.
half = x_size * y_size DIV 2.
ofs = sy-index - 1.
ofs = square2 - sy-index . ofs = rdx * sy-index. ofs = sy-index * rdx + rdx - 1.
seed = seed min = min max = max ). j = ofs + eight_directions. board+j(1) = board+j(1) + 1.
board+ofs(1) = board+ofs(1) + 1. SET HANDLER me->on_sapevent FOR html_control. DATA: param LIKE LINE OF query_table. 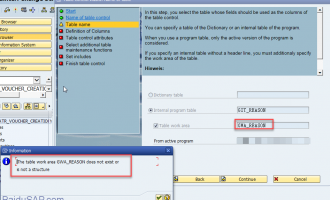 READ TABLE query_table WITH KEY name = 'ID' INTO param. IF sy-subrc EQ 0. cell_ofs = param-value. ENDIF. READ TABLE query_table WITH KEY name = 'TIME' INTO param. IF sy-subrc EQ 0. game_time = param-value. ENDIF. PERFORM game_create USING game_size x_size y_size bomb_cnt. DATA: ofs TYPE i, new TYPE i, len TYPE i, end TYPE i. DATA: jsline LIKE LINE OF js. CONCATENATE LINES OF cells2update INTO buf SEPARATED BY '|'. end = strlen( buf ). IF new > end. " len = end - ofs. CONCATENATE 'b+="' buf+ofs(len) '";' INTO jsline. ofs = ofs + len. CONCATENATE 'updateCells(' game ',"' b_left+1 '")' INTO jsline. CALL METHOD me->set_script( script = js ). table1 TYPE TABLE OF char255 WITH HEADER LINE INITIAL SIZE 150.
" CHECK sy-subrc EQ 0.
" CONCATENATE LINES OF html INTO html_str SEPARATED BY '~'. INTO html_str SEPARATED BY '~'. DATA: xstr(4) TYPE c, ystr(4) TYPE c.
WRITE x_size TO xstr NO-GROUPING. WRITE y_size TO ystr NO-GROUPING. CONCATENATE 'DX=' xstr ',DY=' ystr ',BB="' b_left '";' INTO s.
MESSAGE e000(su) WITH 'html template is broken'. SPLIT html_str AT '~' INTO TABLE table1. DATA: ofs TYPE i, len TYPE i, nex TYPE i.
len = strlen( table1 ). nex = ofs + len. gif_binary_table TYPE TABLE OF w3mime. CONCATENATE s1 s2 s3 s4 s5 s6 INTO gif_base64. DATA: rows TYPE i, pos TYPE i. ASSIGN COMPONENT 0 OF STRUCTURE table1 TO <fs> TYPE 'X'. binary_size = xstrlen( buffer ). rows = ( binary_size + 255 - 1 ) DIV 255.
pos = pos + 255.
html TYPE TABLE OF w3html INITIAL SIZE 150. CALL METHOD html_control->show_url( url = doc_url ). IMPORT lines = high_scores FROM DATABASE indx(st) ID database_id. DATA: s(6) TYPE c, line TYPE c.
FIELD-SYMBOLS: <fs1> TYPE c, <fs2> TYPE c.
CONCATENATE 'hs2_' line INTO s.
CONCATENATE 'hs3_' line INTO s.
READ TABLE high_scores INDEX sy-index. WRITE game_time TO high_scores-time RIGHT-JUSTIFIED. INSERT high_scores INTO TABLE high_scores. LOOP AT high_scores FROM 10. EXPORT lines = high_scores TO DATABASE indx(st) ID database_id.